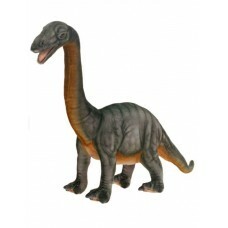 Brontosaurus means ?Ç£thunder lizard. ?Ç¥ They were the largest animals that ever lived. They could grow to over 80 ft long and weigh approximately 35 tons. It is known for its very long neck, which was useful for eating foliage off trees and shrubs. Brontosaurus lived in the Jurassic Period about 150 million years ago.